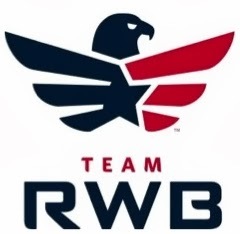 I ran a lot last year, training and racing more, for the year of "winning". While I do think it's a little cheesy to pick one-word themes for each year, I am a blogger after all, and am trying to update once a month again (#7 on the list below! ), so this year I'm dubbing the year of "home and family". Of course I will still run and write up race reports (because I just always will), but it will be nice to work on other things outside of running. Halfway through 2018 I got into the "Happier" podcast, with Gretchen Rubin and her sister. Gretchen wrote the Happiness Project book about 10 years ago and I actually bought a copy then (it's still on my bookshelf), so I was psyched she had a podcast. Having a sister myself, it was fun to listen in on the sister banter. They talked about an "18 for 2018" list, so of course I jumped in halfway through the year but only had 6 (?) months to get through the list, which of course I didn't. So here's my 19 for '19 list. Only a few are repeats from the 2018 list that I didn't quite get to, but most are new. Some are one-time events, some are recurring monthly or weekly activities. Some are very simple and straightforward (like visiting the DE Museum of Natural History), some are much more involved (getting a new roof requires saving up a large amount of money, which requires being more diligent financially). Some can even be overlapped! E.g. dates with Kevin can include going to a new Asian food establishment (haha!) or Longwood Gardens. Print out physical wedding album. Date nights with Kevin 2x/month. Visit Longwood Gardens 6x (every other month). Visit Delaware Museum of Natural History. Go to the beach 3x. Call and FaceTime family more (1x/week, on weekends!). Do each Sufferfest cycling video once. Learn to use Mom’s fancy rice cooker. Learn to hard-boil eggs easier. Paint remaining interiors (man cave, master bedroom, and ceilings). Figure out how to refresh faded red Honda Fit paint job (if possible?). Eat at a new local Asian food establishment 1x/month. Find refrigerator filters and replace every 6 months. Complete a Marie Kondo decluttering of the entire house. 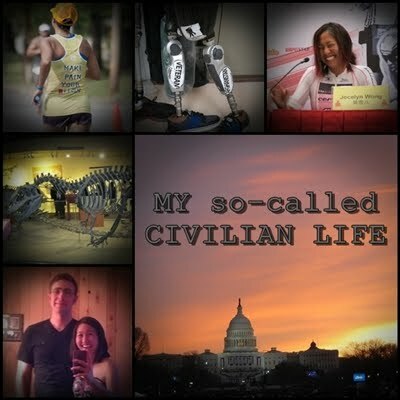 This also makes for great blog fodder, because accountability! FaceTimed with the fam the last two weekends (we have the technology, we should take advantage of it more!). 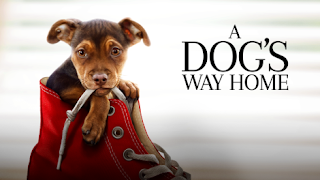 Took Kevin to see "A Dog's Way Home". Totally cried! The CGI cougar was obviously CGI, but still a super cute baby cougar, so you just kind of roll with it. Managing expectations for movies is the key to enjoying them. Cute puppy dog story, rated PG = heartwarming with a happy ending! I'm most of the way through KonMari category #1: clothes. I read the book 2 years ago (it even made it into the blog in early 2017), but never quite completed the whole method, other than learning how to fold the special little rectangular way, which I've kept up with. Her new Netflix show is actually really helpful, because it shows people with way more clutter getting it done, even if the end result isn't perfect. I've done 2 Sufferfest yoga videos but have yet to start tackling the bike videos. 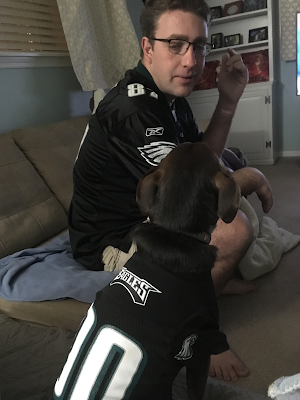 Here is my little family watching the last Eagles game of the season in their matching outfits. Aero started scolding Kevin when he got too vocal earlier into the game. She honestly sat in front of his face and started howl-squeaking at him. No Super Bowl this year, but they got further than we expected! We did copy wedding albums via shutterfly books. They came out really well. There are always discount coupons to be found, let know know if you want one.